Featured Performers at Under St. Marks Theater TONIGHT! See The High Scores as featured performers, aka "very special guests", tonight at Under St. Marks Theater. "What do a dead pope and a suicidal teenager have in common? 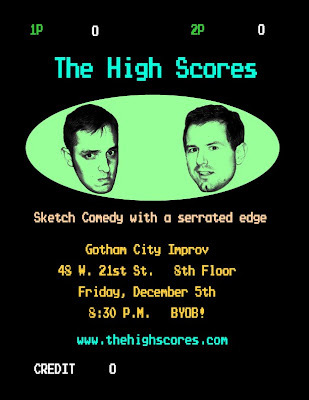 See The High Scores perform sketch comedy with a serrated edge. Featuring: Ian McCormick, Jon Macomber, Ben DiMatteo, Lindsey Hope Pearlman and Betty Kaplan." 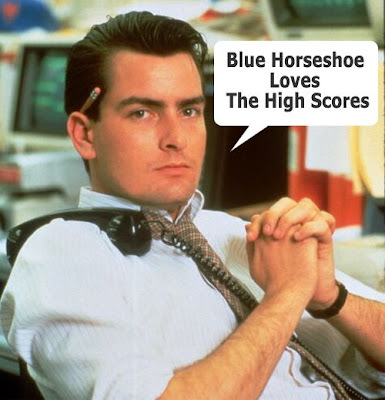 "Blue Horseshoe Loves The High Scores"
Here's a chance to see The High Scores LIVE! Candidates Burt Bailer and James Kosar present political campaign ads about the homeless. Welcome to The High Scores! Children, gather around to hear the story of The High Scores. What are "The High Scores"? The High Scores are a sketch comedy group based in New York City. Formed in 2008, they perform regular live shows in New York City, as well as various festivals and events all over the place. Working on our next big show.